SKU: N/A. 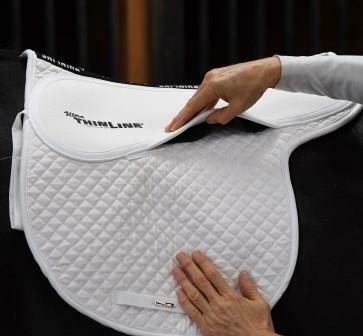 Categories: Shop All ThinLine Products, Saddle Fitting Shims, Therapeutic Saddle Fitting Pads. Want to double your protection without altering saddle fit or changing your pad? It’s easy with the ThinLine+ Booster Saddle Shim! We developed a new protective thickness! Place the shims from the ThinLine+ Booster shim pack into your shimmable ThinLine pad and you’ve now created the maximum in equine back protection. Start with your favorite shimmable ThinLine pad. Use the shims from our new ThinLine Booster Shim Pack and add them to create the extra ThinLine support you need. Remove the shims when you don’t need them. Makes two great pads out of your current Ultra ThinLine pad. ThinLine Booster Shim Pack comes with two full shims (Pair) one for each side. It will slide into the shim pocket of your current pad. Transform Your Favorite ThinLine Pad into a Full-Thickness ThinLine + Plus Pad with the Booster Shim. Booster Shims are sold in pairs. When ordering Western shims choose the One Size option unless you have a barrel shaped pad or a 28 inch square. Q Looking at the full booster shim what are the measurements for Small, Medium, Large and one size? A Hi and thanks for your question! The Booster shims sizes correspond with your pad size. If your pad only comes in one size, you would select the "one size" option. Most of the pads have a size tab on the spine band. If you are not certain which size you have, please give us a call at 888-401-9101 for help. Q I have a thin line/back on track dressage pad. What shims would I use? A Thanks for your question! The Booster Shims are specially designed for each pad. On the Booster Shim product page, in the first drop down menu, select Contender English Pads 8020 8021. In the second drop down menu, choose One Size. If you have any further questions, please call us at 888-401-9101. Q I need to use a bridging shim (ultra) in my trifecta 7305. Can I place the booster shim under it or will all not fit in the pocket? A Thank you for your question! The bridging shim can be placed on top of your booster shim. If you need additional help with fit issues, we recommend working with your saddle fitter and trainer. Q Does the booster shims fit in the trifecta 7305 ? A Thanks for your question! There is a booster shim specially designed to fit each pad. When you order the shim, simply select the particular pad from the drop down list. Q Is this a pair of shims? A Thanks for your question! All of our shims are sold in pairs.